This week, a student asked why teachers cue the transition from Warrior I direclty into Warrior II during vinyasa sequences. She further stated it’s one of the most difficult and disruptive transitions in a sequence. If you think about it, there are few other poses that utilize the warrior I stance. 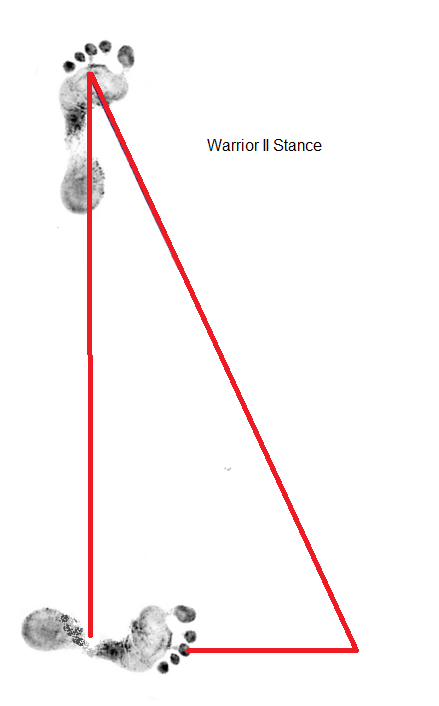 Most of the basic standing poses have the same foot and hip placement as Warrior II. Reverse Warrior and Humble warrior can be achieved from the Warrior II foot placement as well as Trikonasana, Side Angle,(extended and bound) and Ardha Chandrasana. 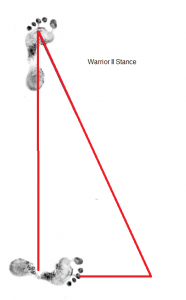 The student further elaborated that in order to make the transition from warrior 1 to warrior II you need the heel of the front foot to be in line with the heel of the back foot. This way, you don’t have to change the foot placement. But, if the feet are in this kind alignment, it’s impossible to get both hip points aligned with the front of the mat. I often see students with wrong foot placement in warrior I and often demonstrate finding foot placement for the posture by starting from Tadasana and stepping back while keeping awareness on the hip bones and their alignment in relation to the front of the mat. 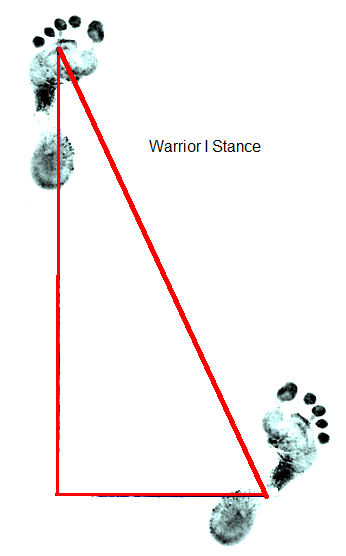 When you step back from Tadasna, with the feet as wide as the hips, the back foot lands in the right spot to be able to correctly do Warrior1. But now we’re back to the whole point of the pesky transition to warrior II. And I completely agree. A Warrior I to Warrior II transition is no transition at all. They are really just two completely different poses. From the hip’s and shoulder’s perspectives, there’s a 90 degree difference between Warrior I and Warrior II. Perhaps a more favorable transition from Warrior I would be to Revolved Side Angle or even Revolved Trikonasana. But asking a student to flow from Warrior I into Warrior II is never going to be a smooth transition unless they are executing Warrior I without proper alignment of the hips and inner rotating the back leg thigh. As a student, take time to experiment with Warrior I. It’s very similar to high lunge except the focus is on inner spiral of the back leg (hence the reason for placing all four corners of the foot on the mat). Work with Stepping back into Warrior I from Tadasana vs. Stepping into it from downward facing dog. Try varying the foot placement of the back foot, stepping it wider on the mat, while keeping the hands on the hips. As a teacher, find what works for your students. If your style is more of a Vinyasa style of yoga, Leave warrior I out of your sequence transitions. If you must move directly into another pose from Warrior I, experiment with asanas that compliment the correct alignment of the pose, like Warrior III or Standing splits, or even some of the Revolved Standing Poses. If your focus lies on teaching alignment based asanas, explore, contrast and compare the different foundations of warrior I and how to get students into the pose. Experiment with your transitions and your flows. Find the little nuances like this. They may seem insignificant, but the effect they have on a person’s practice may distract them from the sukha of their practice. After hearing my students and following this advice, I’ve decided to eliminate sequencing these two poses side by side. Critique your own flows and sequences to continue refining your practice for yourself and for your students. Is not that serious; simply adjust the placement of the back foot as you adduct the arms on the way to Warrior II. By the time the arms arrive to their rightful positioning, the back foot will have had enough time to lessen the lateral distance between it and the front foot (for heel-to-arch alignment). That’s all. Further, the hips are not to be square in Warrior I. Is physically impossible without torquing the back knee. Rather, one should, as my teachers say, “effort towards” squaring the hips by drawing the hip point of the front thigh back while directing the hip point of the back leg forward. I don’t necessarily agree. There’s no right or wrong answer. This was written in regards to smooth flows without interrupting the sukha by changing foundation. Seriousness is subjective. Hips can be square to the front of the mat in warrior 1 without strain on the knee, I see it often, and with people who have practiced decades or only for a few months, therefore it’s not ‘impossible’ as you put it. Practice on, friend. Please, please, please for the love of your student’s sacrums, angle the toes of the back foot forward while maintaining heel to heel alignment. This allows the back hip to dance forward without jamming the sacrum. Happy trails! You mention that ‘Humble warrior can be achieved from the Warrior II foot placement’… In class we often go from Warrior 1 to Humble Warrior but it seems quite awkward for me to get my shoulder past my knee. Is this due to incorrect sequencing / foot positioning? It could be due to a number of things. Not enough time in the pose, limited flexibility in the ham string, the angle of the hip socket, the strength of the hip flexor.Just remember, there is no right or wrong way in yoga. There is simply what works for you and what does not.